As I said a while back, "Anybody could write two articles per day, forever, just refreshing the Weekly Standard or National Review and breaking down the current iteration of craven dishonesty. The trouble is that it's exhausting." But now and then, somebody at the WS or NRO makes it too easy. Can anyone tell me why people are such schmucks? Why they are so graceless and clueless and nasty? Whatever. It is practically universally acknowledged by objective observers, and by many right-wing admirers of the former president, that George W. Bush is, to put it charitably, intellectually incurious. Being an unintellectual regular-guy was part of his political appeal. Pareene's a fun writer, but like a lot of Salon and Gawker personnel, he tends to hammer at the argument being made without taking the chance to advance one about the people making it. That's no indication of his talent and probably reflects the limits to his schedule more than anything. But in this case, I don't believe it would have taken too much additional effort to make a note of something. The National Review is very good at expressing outrage at indecency. Nordlinger inveighs against people being schmucks, being "graceless and cluess and nasty." 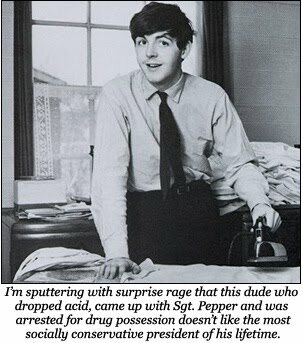 He wants to know why McCartney can't behave "like a gentleman" or "at least a non-boor." Fair questions for Jay, but — while I admit that many of the results are about people other than president Obama — they're better asked on a website whose search function doesn't turn up 53 articles with the word "teleprompter," with doubtless several featuring boorish and ungentlemanly accusations of sub-par intelligence because a Democrat uses a device employed by every single national American politician. They're also better asked on a website that doesn't take every opportunity to micro-analyze the president's jump shot or pitching arm to suggest he's some kind of effete and womanish non-American. Let's Execute Fags; or, "Cliffy, Eat Da Poo Poo!" Youtube Doubler VIII: It's a Gusher!! !